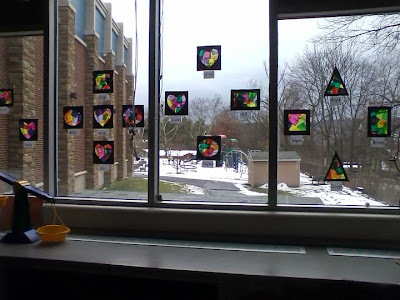 Every season in our Pre-K class, we like to have something pretty in our windows. Recently, we've been studying shapes and colors. What better way to explore those two things together, than with stained window projects? For this project, we searched the internet to find some ideas. Then we modified what we found somewhat, to fit our class. However, for our class, we decided to use wax paper and glue. Wax paper is less expensive than contact paper, and painting the glue onto the tissue paper led to some nice small motor skill activity, and some great discussion about how the colors blend together when the tissues are overlapped. Each child was able to chose the shape of their frame, (heart, square, rectangle, oval, or triangle) which was then glued to the finished and dried piece of wax paper and tissues later. The frames were pre-cut ahead of time using black construction paper. Here is the results of our new window treatment for winter, they are quite stunning when the sun is bright. I'm looking forward to trying this again at home during the winter break with my grandchildren. They make a nice colorful addition to any sunny window!